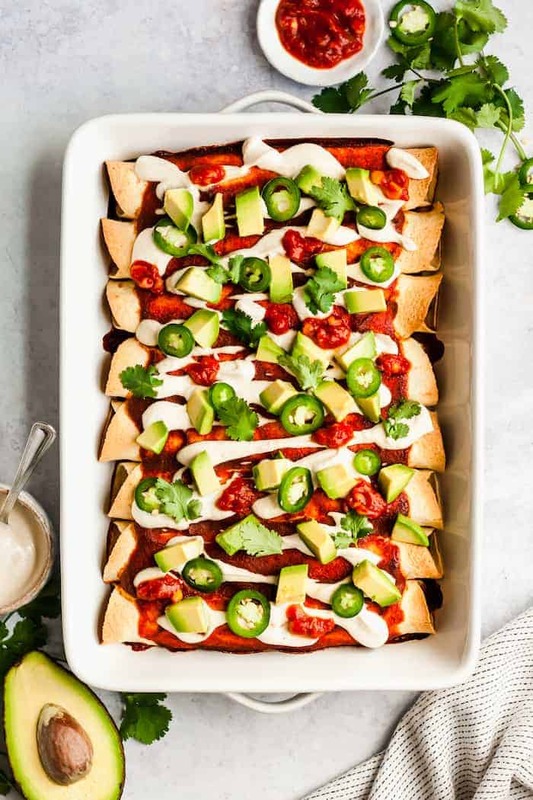 This epic Vegan Enchiladas with Black Beans and Kale recipe is a creamy, satisfying and wholesome plant-based meal. Kid approved and gluten-free! Whenever I make enchiladas I feel like I should do the Macarena. 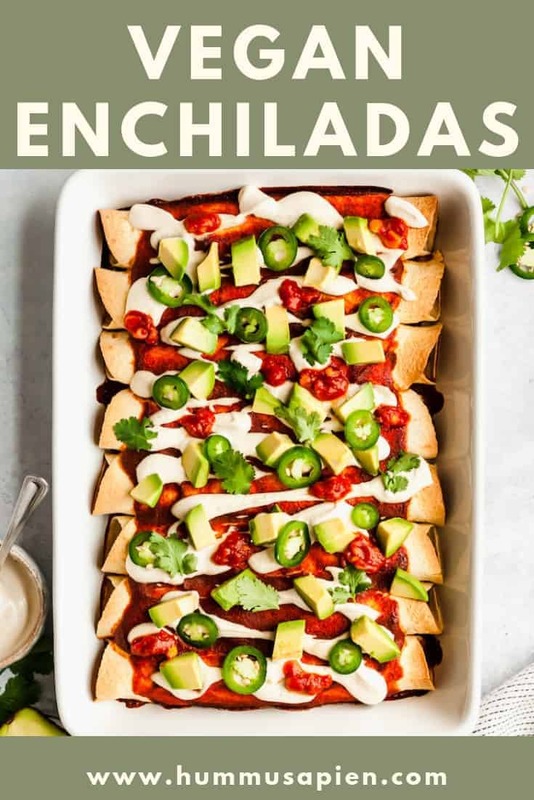 Ok not let’s talk VEGAN ENCHILADAS. This is one of those meals where you’re like, wait—where’s the cheese? But I swear to you, these enchiladas are insanely creamy sans dairy thanks to the raw cashews. I even topped them with a non-dairy sour cream to really kick up the creaminess factor a notch because…texture. Jeff and I look so forward to enchilada night! We’ve got avocado, cilantro, jalapeños, cashew sour cream…the gang’s all here. It’s fiesta time! These enchiladas taste incredible whether you follow a vegan diet or not. My meat and potato lovin’ boyfriend ADORES them! Now a word about the ingredients. You can totally make your own homemade enchilada sauce, but I typically use store-bought for convenience. I used red enchilada sauce, but green is totally fine, too. Organic corn tortillas are my go-to, but if you prefer flour, by all means GO FOR IT. The cashews in the filling and sour cream are definitely essential—I wouldn’t recommend subbing anything else. I use raw cashews versus roasted ones because they have the best flavor for our purposes. If you’re not feeling black beans, chickpeas, lentils (who remembers my lentil enchiladas?! ), or kidney beans would work perfectly as well. More good news? 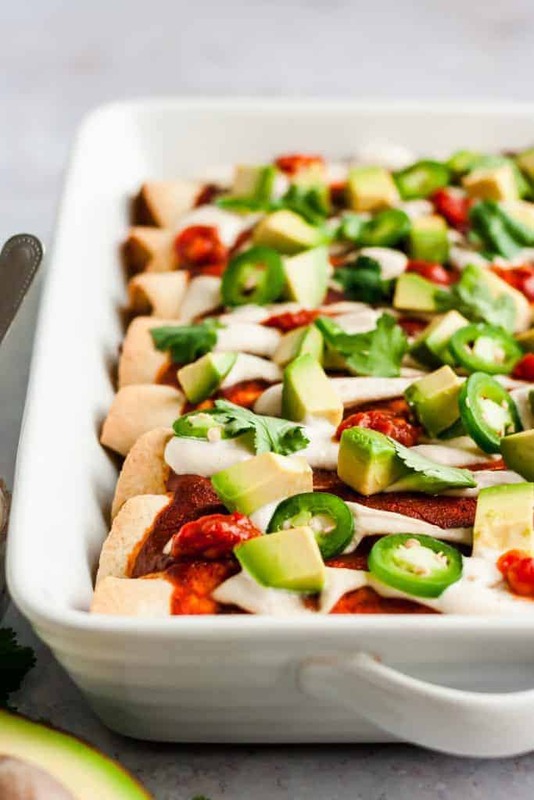 These Vegan Enchiladas are freezer-friendly. Check out the recipe notes for all the deets. The filling is mighty tasty on its own topped with avocado and hot sauce, if I do say so myself! 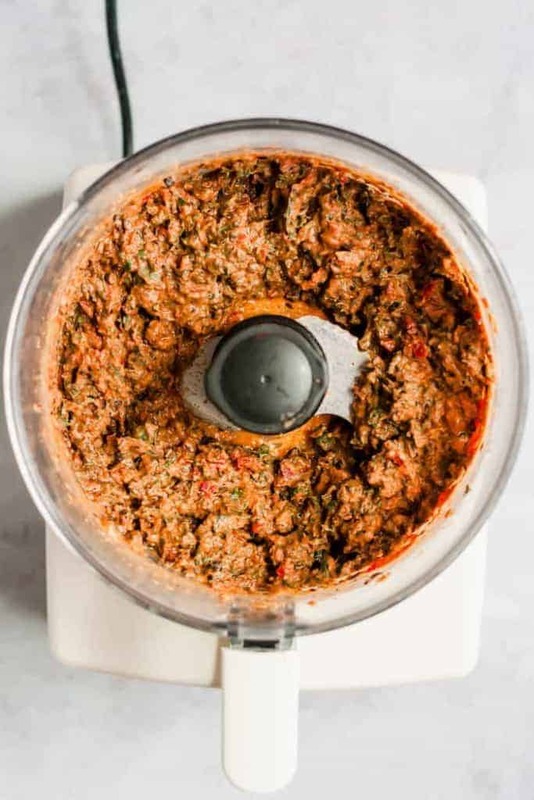 I like to blend the cashews and salsa in my food processor and then add the rest of the ingredients right in there afterwards. Less dishes! For the cashew sour cream, I get the smoothest results using my Nutribullet. You could also use a high-speed blender. Get yourself a nice large rectangular baking dish like this one. I have this one and I love it because it’s HUGE–perfect for lasagna, too. 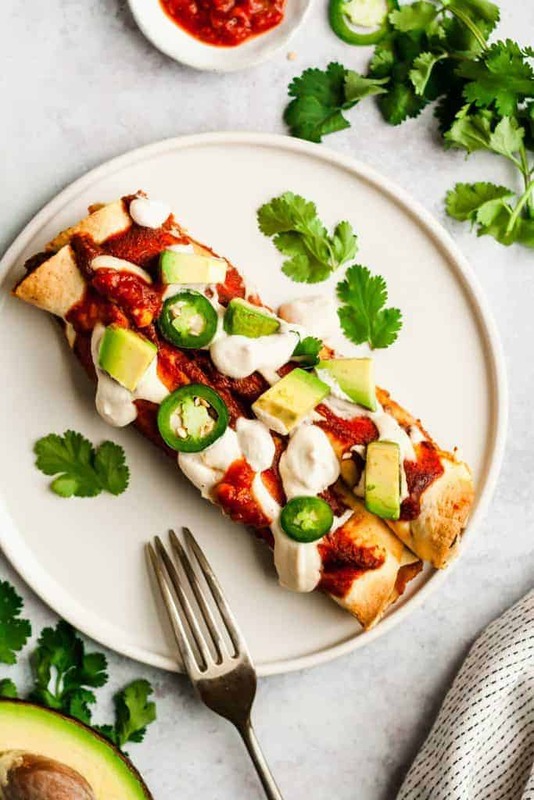 If you make this vegan enchilada recipe and your love it, pretty please let me know by leaving a 5-star rating and/or comment! I hope it becomes a weeknight favorite for you, too. Place 1 ¼ cups cashews (for enchiladas and sour cream) in a medium bowl. Cover with 3 cups of boiling water and allow to sit for 20 minutes or (or overnight in warm water). Preheat oven to 350F. Drain and rinse cashews. 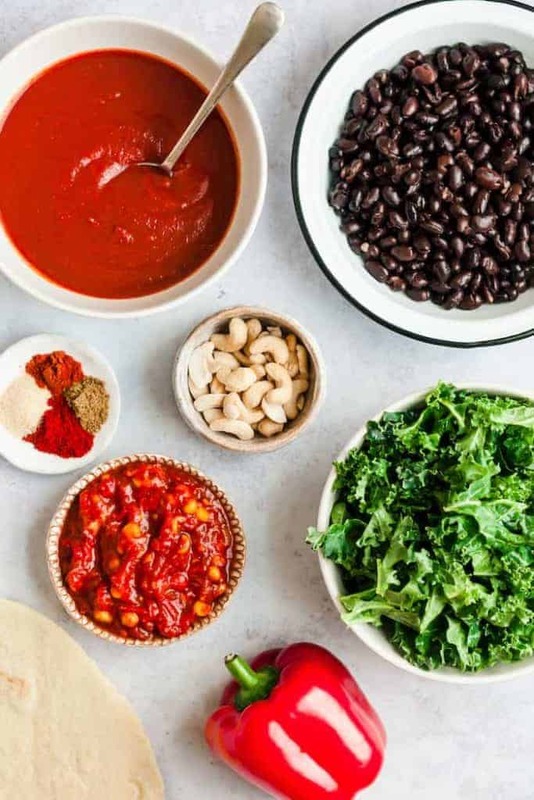 Place ½ cup of the cashews and the salsa in a food processor with salsa and blend for about a minute, or until smooth and creamy. Add beans, pepper, salt, and spices. Process until mixture is combined but has some texture. Add in the torn kale and process just until the kale is broken down. Warm tortillas in the microwave for about 15 seconds if needed. Using a 13×9 pan, pour just enough sauce to cover bottom. Spoon filling into tortillas, fold them up, and place seam-side down on the pan. If the tortillas break, that’s ok. Once all enchiladas are all next to each other in the pan, cover them liberally with the rest of the enchilada sauce. Bake for 30 minutes. Meanwhile make sour cream by draining and rinse remaining ¾ cup cashews. Blend in high speed blender or Nutribullet with water, lemon juice, and salt, adding more water if needed. Drizzle on enchiladas and serve with avocado and salsa. Filing can be frozen for up to 3 months. Thaw before using. Store leftovers in the refrigerator in an airtight container in the refrigerator for up to 3 days or freeze up to 3 months. Recipe by Alexis Joseph of Hummusapien™. Photos by Eat Love Eats. Recipes and images are a copyright of hummusapien.com. Thank you tons for the positive feedback, Shane! OMG these were AH-MAZE-ING! I used the homemade enchilada sauce you recommended, which was fabulous! I also subbed some corn for the bell pepper cause it’s what I had. I made my meat and potatoes lovin husband try it and he said it was delicious! This recipe is going to be on repeat for the next several months! I love the changes you made! Corn is always a good idea. Thanks so much for the feedback! My carnivorous husband said this was one of the top five dishes I’ve ever made. I served it with some cilantro lime rice and it made an amazing meal with plenty of leftovers. This’ll be on repeat in our house! Wahoo! Thanks for letting me know!! Made these last week and my roommate and I loved them!! We are going to make them again for a dinner party :) They had just the right amount of spice. Wonderful! Thanks for letting me know, Rachel.